This Roquefort & Walnut Rolls recipe is not necessarily one to prepare ahead – although I may try freezing them and see what happens. This bread roll recipe is from Paul Hollywood, taken from Good Food, and just sounded the perfect accompaniment to a big bowl of steaming soup over the Christmas period. Just a bit more special than the usual bread rolls. Looking forward to eating these, maybe with my Minestrone Soup using the Turkey stock. Don’t they just look yummy! Important: This dough mixture needs 2 - 2 1/2 hours of kneading before being ready to cook. 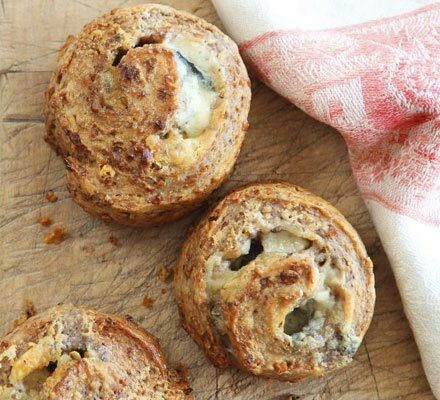 This Roquefort & Walnut Rolls recipe sounds absolutely delicious, and great for using up your left-over walnuts and cheese at Christmas time. Paul Hollywood recommends eating these either on their own, or served with soup or a chunky salad with crunchy apple as part of the ingredients. A definite 'must' in our house. Place the walnuts in a food processor and pulse to chop finely; leave to one side. Put the flours 10g salt, yeast, butter and 300ml water in a bowl, stir together and begin massaging the ingredients for a minute. If the mixture seems dry, add more water at a time to make a soft but not sticky dough then knead in the bowl for a further couple of minutes to bring the dough together. Tip the dough onto a lightly floured work surface and knead well for 10 minutes before returning to the bowl. Cover the bowl with cling film and leave to rise in a warm place for one hour. Briefly knead the walnuts into the dough, then leave to rise in the bowl for 20 mins. Tip the dough out onto a lightly floured surface and roll out into a rectangle, approx 50 x 20cm, 1 cm thick. Sprinkle the Roquefort evenly over the dough and lightly press in. Place the rectangle width-ways in front of you and roll up the rectangle like a Swiss roll. Cut into 8 equal sized pieces and place then onto a lightly greased baking tray, cut-side down. Cover with cling film and leave to rise for one hour. Heat oven to 220C/200Cfan/Gas 7. Brush each round of dough with the beaten egg and bake for 20 mins. Leave to cool for a few minutes and eat whilst still warm. Important: This recipe needs approximately 2 1/2 hours resting time for the dough before cooking. The Roquefort & Walnut Rolls recipe sounds absolutely delicious, especially at Christmas time. You could use a different flavour of cheese, maybe a pinch of cayenne or paprika? Luckily for me, Roquefort is one of my favourite ‘luxury’ cheeses, and I just have a nice chunk sitting in my fridge as we speak, so it definitely will be Roquefort & Walnut Rolls in our house. Just a different flavour to go with a bowl of soup, a crunchy salad or just on their own. Best eaten warm, maybe with a knob of salty butter. Yes please!